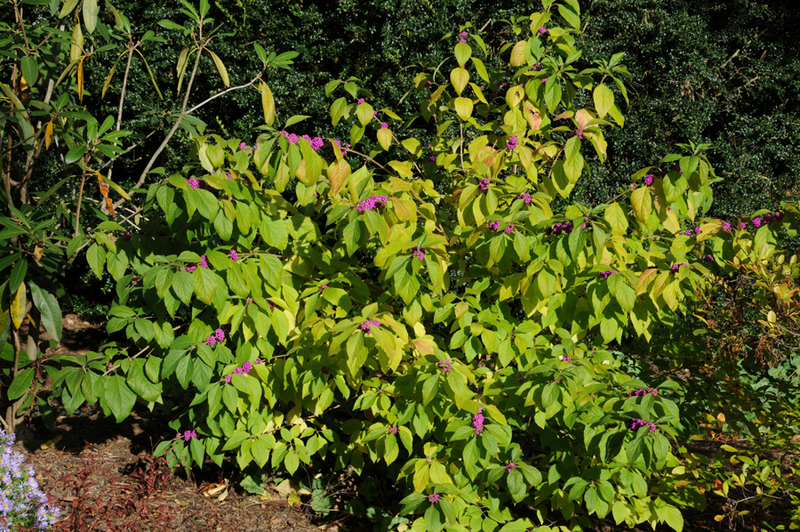 French mulberry scientifically known as Callicarpa americana is a loose open shrub appreciated for its spectacular fruits. 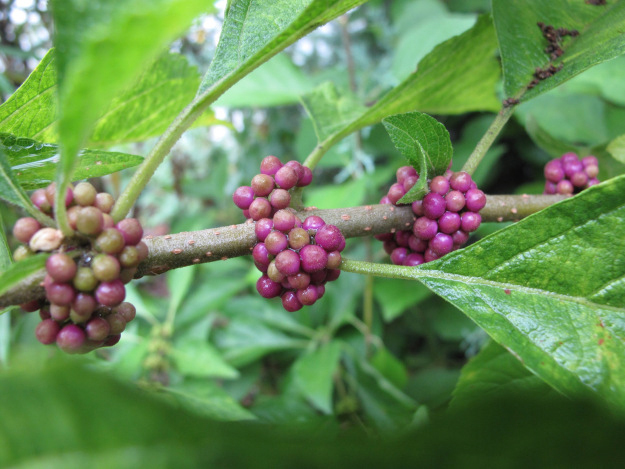 It is of the genus Callicarpa L. (beautyberry) of flowering plants in the family Verbenaceae (Verbena family). 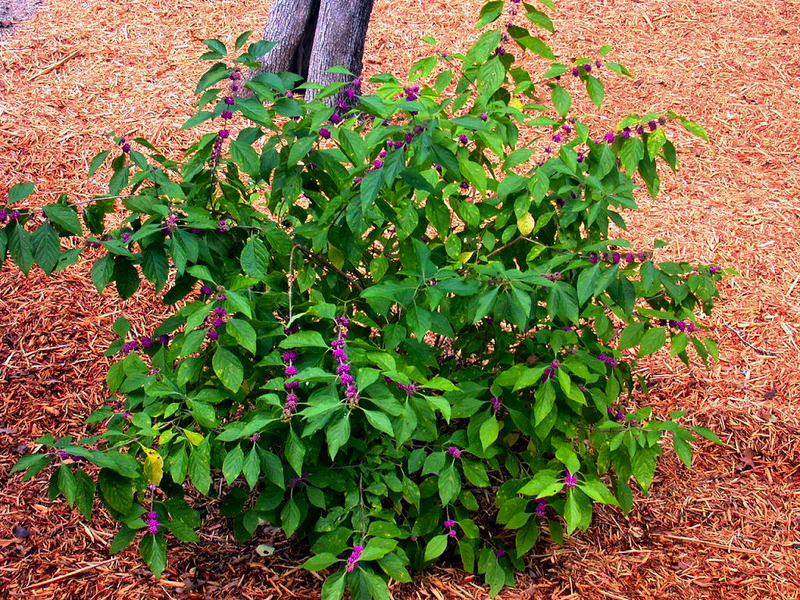 The plant is native to Southeastern United States and commonly occurs in all states of the region except Kentucky. The species ranges from coastal Maryland south through the northern two-thirds of Florida and west to extreme southern Missouri, eastern Texas, and eastern Oklahoma. It is also found in Mexico and the West Indies. 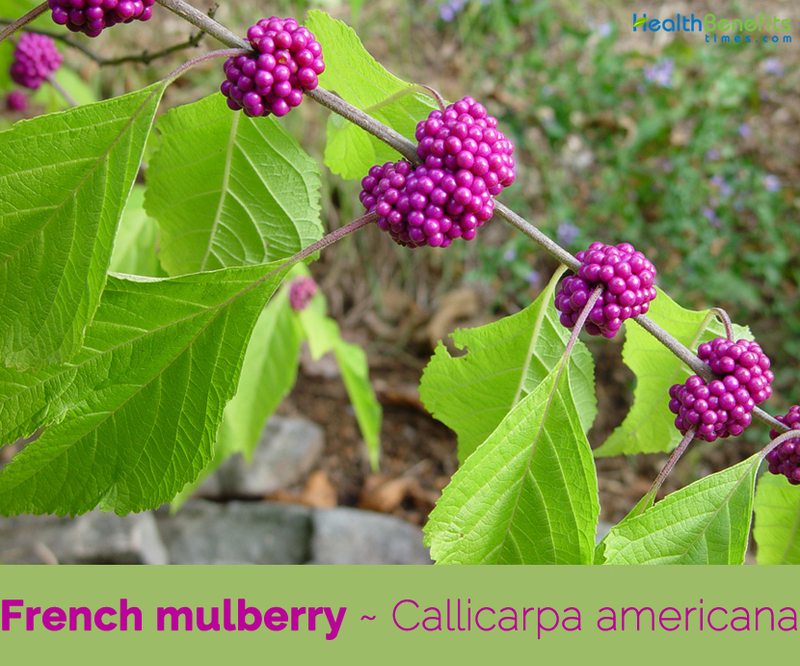 Few of the popular common names of the plant are American beautyberry, Spanish-mulberry, French-mulberry, Bermuda-mulberry, sour-berry, sow-berry, Beautyberry and American Mulberry. Genus name comes from Greek meaning beautiful fruit. Specific epithet means of the Americas. The roots, leaves, and branches were used by various Native American tribes for medicinal purposes to treat malarial fevers and rheumatism. 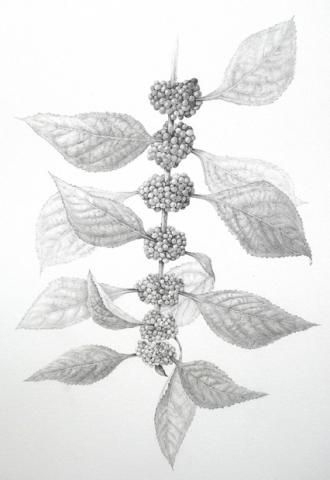 French mulberry is a fast growing, deciduous, perennial many-branched shrub that grows five to eight feet tall and almost as wide with drooping branches. The plant is found growing in longleaf pine-turkey oak/sand-hill association, mixed hardwood-pine forests, south Florida flat woods, cabbage palm flat woods, wetland hardwood hammock plant communities, woods, particularly on moist areas under open pine canopies, thickets, right of ways, and fence rows. Normally the plant grows well in moist, moderately to well-drained, fertile loams. However, it is tolerant of most soils and is often found on poor, clay soils along woodland edges. 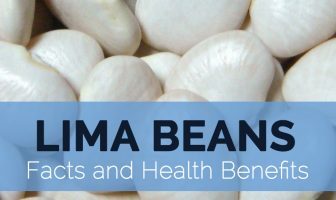 It will grow on dry, rocky sites and can survive soil conditions of low fertility and high salt content. Stem is slender, gray to reddish brown, and terete or four sided. Older stems are brittle and usually have small and thin scales. Twigs are slender to moderate, scruffy gray-scaly and brown, light lenticels, oval leaf scar with a single bundle scar, buds small and naked or with a few scales. Bark is brown with numerous raised lenticels. Aromatic, soft-textured leaves are simple, opposite, and occasionally ternate (present in threes). 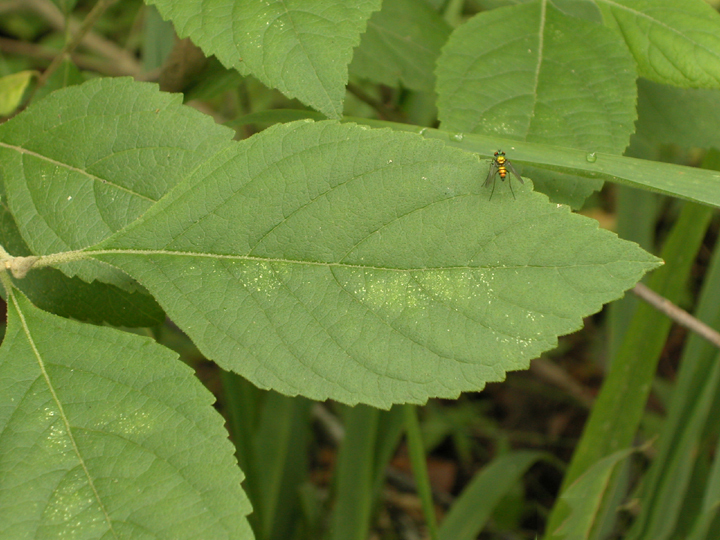 The upper leaf surface is dark green to yellow green and glabrous to slightly pubescent, while the ventral surface is paler and pubescent with stellate trichomes. Leaves are oval to elliptical in shape, 3 to 9 in. (7.6 to 23 cm) long, and approximately 2 to 5 in. (5 to 12.7 cm) wide. They taper to points at both the apex and base and have coarsely toothed margins and prominent veins. The pubescent petioles are 0.6 to 1.4 in. (1.5 to 3.5 cm) long. The perfect, pale blue to pale pink flowers is 0.12 to 0.2 in. (3 to 5 mm) long and form clusters of 0.33 to 1.5 in. (0.85 to 3.8 cm) at the leaf axils of current growth. Flowering begins as early as March and April but is most abundant in June and July. 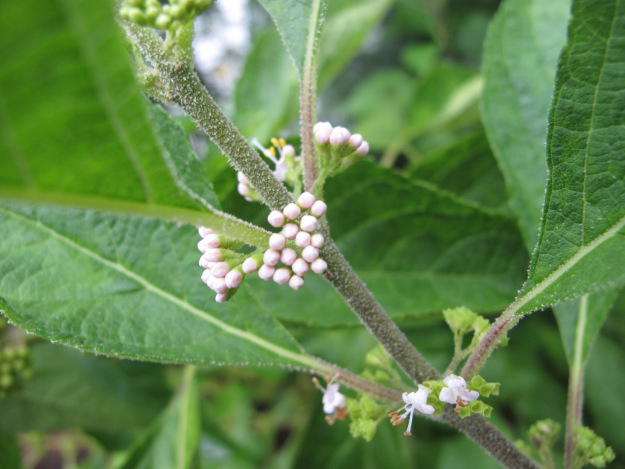 Flowers and new leaves may be produced at branch tips throughout the summer and early fall, even while mature fruits are present on the same plant. Fertile flowers are followed by showy, bright violet- to reddish-purple drupes (sometimes called berries). 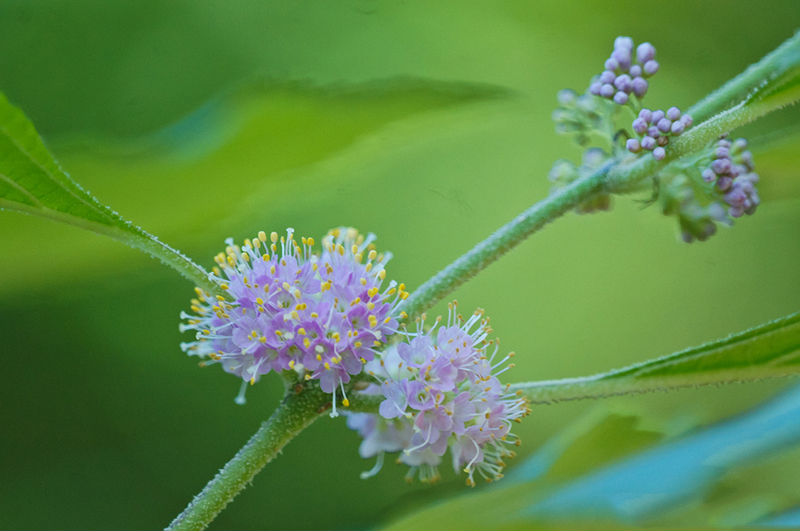 They are the most prominent characteristic of American beautyberry. Drupes are 0.13 to 0.25 in. (3 to 6 mm) in diameter and are borne in the leaf axils in dense, round clusters that encircle the stem at regular intervals. Drupe consists of 4 yellowish brown seeds, each of which is about 0.03 in. (0.7 mm) long, rounded on the back, and flattened on the inner surface. The drupes may be noticeable as early as June but become more conspicuous with maturity in late summer and early fall. Fruits persist well into winter if not eaten by birds and other wildlife. Decoction of the root bark has been used as a diuretic. Leaves are a cure for dropsy. Tea made from the roots is used in the treatment of dysentery and stomach aches. Tea made from the roots and berries is used in the treatment of colic. Some native North American Indian tribes used the leaves and roots in sweat baths for the treatment of malaria, rheumatism and fevers. Roots were used to treat dizziness, stomachaches and dysentery. 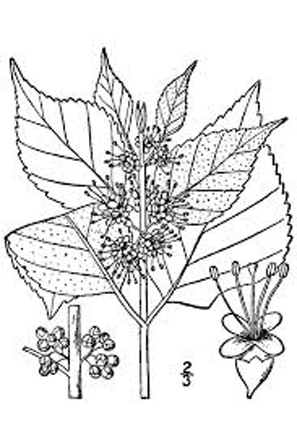 Root and leaf tea was used in sweat baths for rheumatism, fevers, and malaria. Root tea was used for dysentery and stomach aches. Root and berries were used for colic and as a treatment for a wide variety of common ailments. Bark from the stems and the roots were used to treat itchy skin. Root of this plant is useful in relieving rashes on the tongue if chewed. In the early 20th century, farmers would crush the leaves and place them under the harnesses of horses and mules to repel mosquitoes. Farmers rubbed the crushed leaves on themselves to repel mosquitoes and biting bugs. 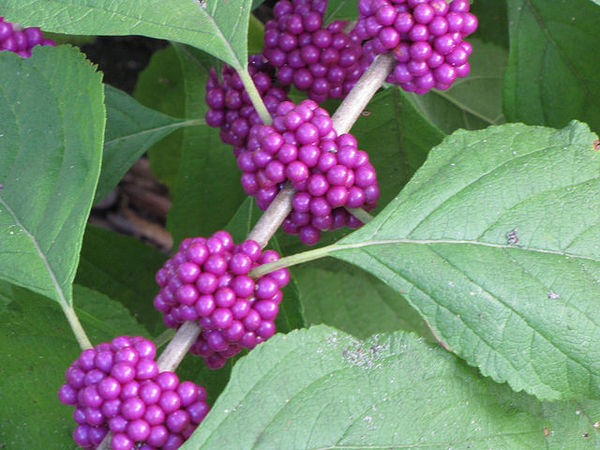 American beautyberry is used as an ornamental shrub in mass plantings, borders and container planting. 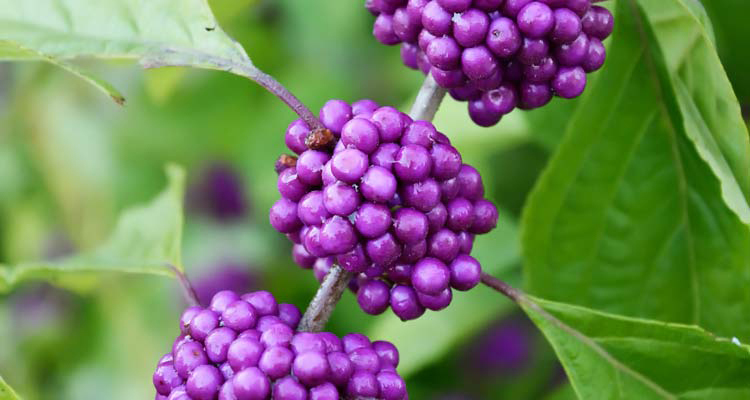 Beautyberry is occasionally planted as an ornamental outside its natural range. Soil Grows well in moist, moderately to well-drained, fertile loams. However, it is tolerant of most soils and is often found on poor, clay soils along woodland edges. Leaf Elliptical to ovate shaped leaves have an opposite arrangement with saw toothed margins. The underside of the leaves may be covered with wooly like hairs. 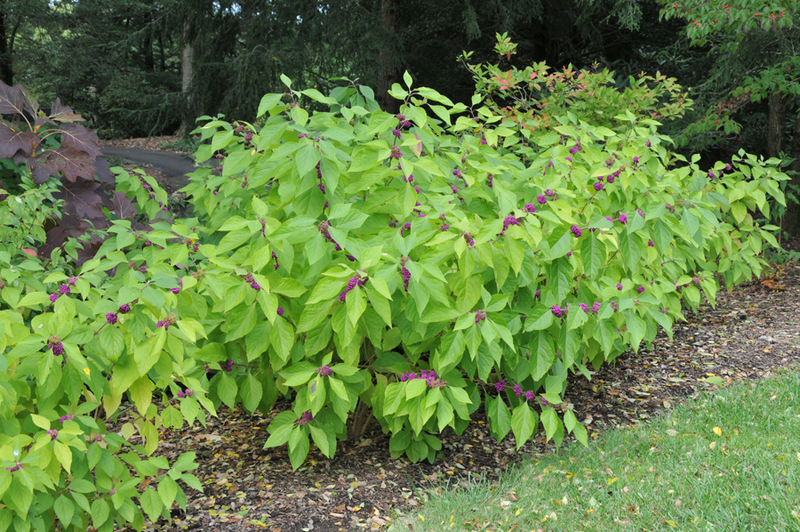 Callicarpa americana var. lactea F.J.Müll. 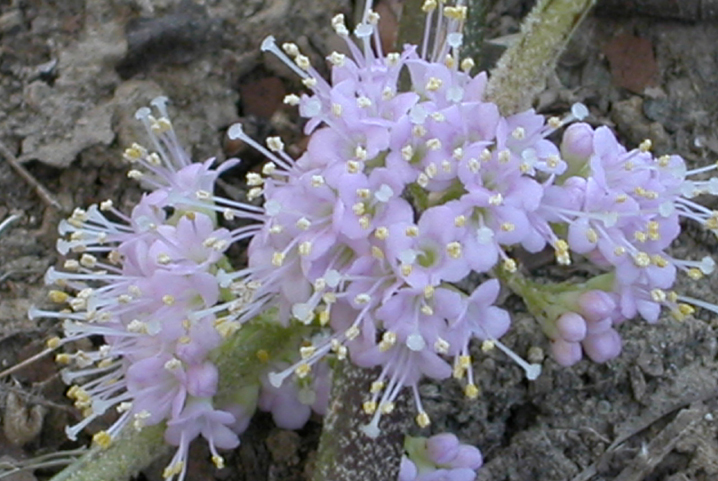 Callicarpa americana var. purpurea F.J.Müll.